With our original intentions being to spend time with a friend, we had travel plans that got us into the city early in the morning. Unfortunately, our friend was unable to return to the city at the last minute, but we opted to keep our original travel plans and found a hotel to stay overnight. Arriving early meant we dropped our bags at the hotel for storage and wandered around the Park Slope neighborhood in search of some breakfast. 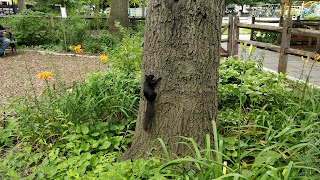 Bagels in hand, we grabbed seats in Washington Park and enjoyed our food, watching as parents played with kids in the playground, squirrels darted back and forth between the trees, and people tended to their plots in the community garden. This park, which is also a historic site, was the location of the Battle of Brooklyn, one of the largest during the Revolutionary War. The park is also home to the Old Stone House, a Dutch Colonial era home that was relocated to Washington Park from its original site only a few miles away in Gowanus, now serves as an interpretive and educational center focused on the history of Brooklyn. All of it was a lot to take in so early in the morning, and before the coffee had really kicked in, though we thoroughly enjoyed the few moments of peace that preceded what would end up being an eventful day. The morning rush hour had just started as we began our further exploration of Park Slope, trekking down 5th Ave as the various shops were starting to open. We passed numerous restaurants of differing ethnic cuisines, marveling at the images of delicious-looking meals as we wandered in search of nothing in particular. Since we were so early, most stores were just starting to open and many places had not yet even fully rolled up their metal gates. The streets were already filling with people of all backgrounds, despite the damp weather. To pass the time, my wife and I found a nail salon that had just opened so that she could get a mani/pedi before the wedding we would be attending in upstate New York. With over an hour taken up with the grooming, we decided to take a stroll along the streets of Brookyln, headed towards Prospect Park. All along the tree-lined streets, there were signs for homes up for sale. Out of curiosity, we poked around on Zillow and discovered that many of the brownstones we passed were worth multiple millions of dollars. Some of the homes were older and had not been updated in nearly a decade, but prices definitely lived up to New York's reputation of being one of the most expensive cities in the world to live. As we plodded through the neighborhood and then into the lush greenery of Prospect Park, the sky, which had wept an occasional drop here and there, opened up into a full-on downpour. We ran and sought shelter under a tree, figuring out our next move. The rain was short-lived and we soon were able to continue on again, making our way towards the Green-Wood Cemetery, only to arrive and find that not all the gates were open on weekdays. 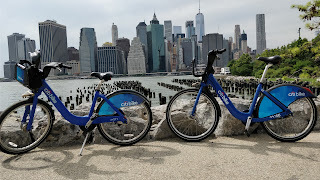 Cursing our miscalculation, we changed our tact and decided to seek out a pair of Citi Bikes. Despite some technical challenges at first, we finally found a pair of bikes and set off towards the waterfront. The streets of Brooklyn, despite being crowded with cars and people, are surprisingly well suited for cycling. 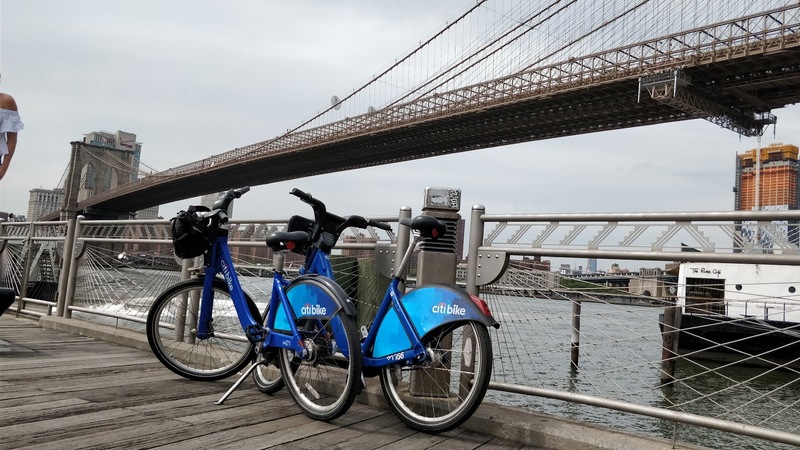 A lot money has been invested in adding infrastructure that genuinely allows for bikes to be used as a means of transportation, giving people access to not only their places of work, but places of play as well. We rode through Brooklyn out to the waterfront and followed the path north to the Brooklyn Bridge Park. Tucked in the shadow of the monolith that is the bridge, the park incorporates a huge swath of the waterfront and includes facilities for basketball, roller skating, soccer, and all manners of outdoor activities. Above the park is the Brooklyn Heights Promenade, which offers exceptional views of the waterfront as well as the Manhattan skyline. Access to the park is phenomenal, with public transportation options relatively close by and within easy walking distance, tons of bike share stations spread throughout, and even a smattering of parking, the Park easily becomes a focal point of recreational life since it has so much to offer. If only we could have something of a similar caliber in LA. After lunch, we resumed our riding, but this time with the intention of hitting the bridge. 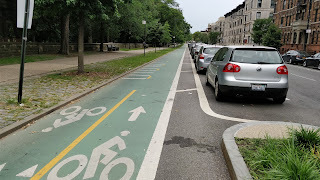 We wound our way from the park to the entrance to the bridge's bike lane. For those not familiar with it, the Brooklyn Bridge is a marvel of post Civil War-era engineering. 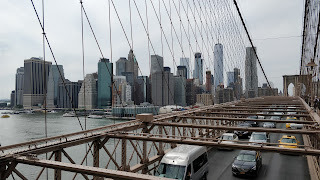 It spans the East River and connects Manhattan to Brooklyn, housing three lanes of vehicle traffic in each direction along with the now infamously crowded pedestrian and bike path tucked between the two spans. 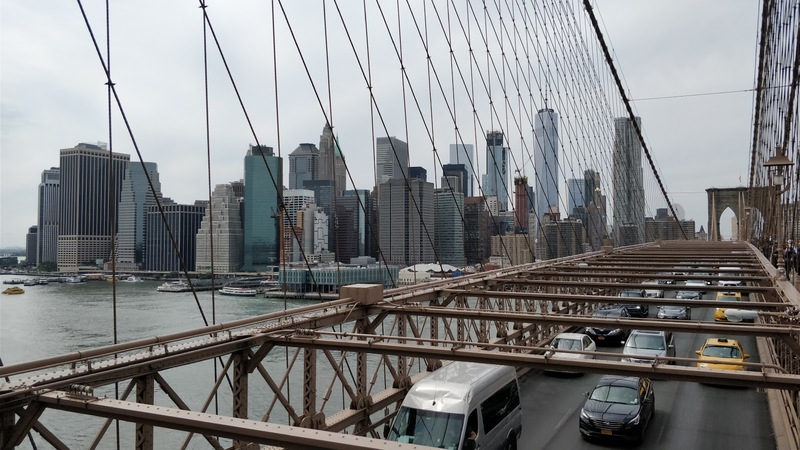 The ride up the bridge is itself not terribly challenging, but navigating the crush of oblivious tourists and hardened NYC commuters is not for the faint of heart. We found ourselves having to constantly ring the bike bells or yell out to remind pedestrians with their heads buried in their phones or standing astride the lanes for photos to get out of the way. Some leaped out of the way promptly while others cursed at us and tested our patience. 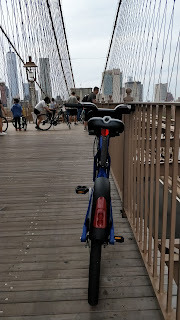 We opted not to ride the entire length of the bridge, mostly in the interest of time, but did manage to get over the middle of the East River and snap a few photos of our own, albeit in areas where bridge supports allowed the path to widen significantly. Braving the equally harrowing experience back to the Brooklyn side of the bridge, we decided to spend a little more time at the waterfront park, again admiring the amenities and the diversity of its patrons before parking the bikes and deciding to return to our hotel to collect our luggage, check-in, and grab a quick nap. 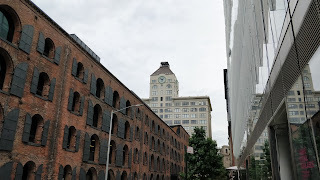 In only a matter of hours, we had a chance to explore a small slice of the wonders that Brooklyn has to offer. 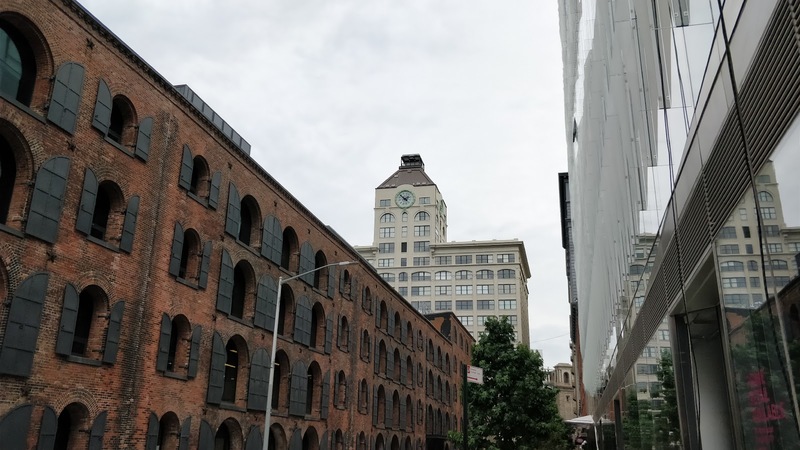 While we got to see only a few key spots, we knew that this part of New York City has so much more to offer. Our sense was that there is so much more to explore and we already knew we wanted to return in the future. Brooklyn has developed a reputation for becoming a gentrified haven for hipster millennials, but that is only one side of the story. It is still a superbly diverse part of one of the most bustling cities in the world and offers tastes of various regions of the world. 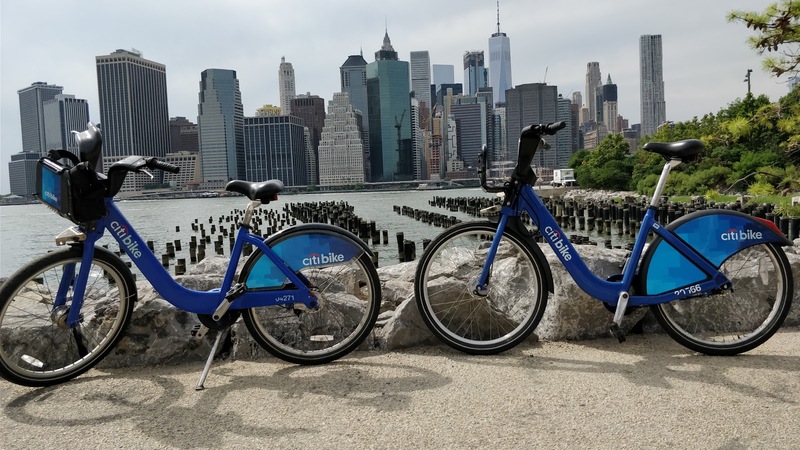 Having the chance to experience it up close by bike is definitely still the best way to see any part of New York City. 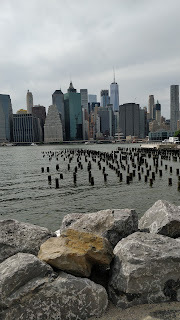 If like me, you have largely spent your time in Manhattan, I highly recommend a trip to Brooklyn for a change of pace and scenery. 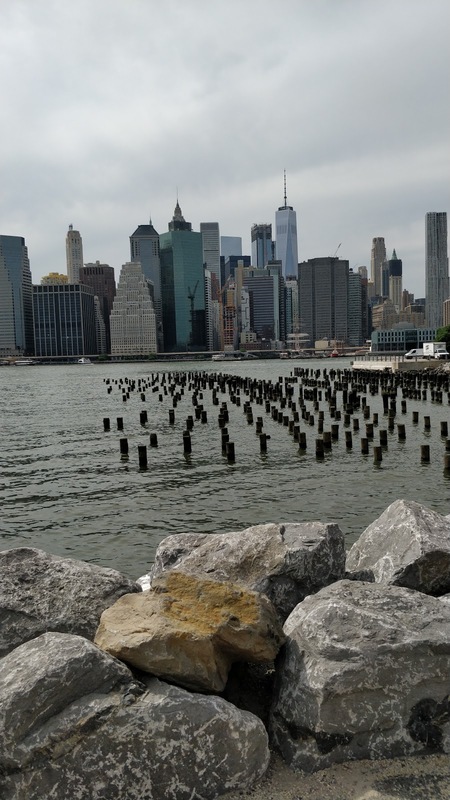 It really shows that there is so much more to New York than what most tourists see. Exploring each of the boroughs will become a major goal for every future trip to NYC for us.